Sunday Funday Linkup: Chocolate Curls, Crisp White Shirts and A $50 Nordstrom Gift Card Giveaway! Welcome to our weekly linkup party! This week we're chatting chocolate curls, crisp white shirts, and giving away a $50 Nordstrom giftcard (just in time for their epic Half Yearly Sale)! May your every dessert be adorned by the perfect chocolate curls, thanks to Fab Fatale's super easy step-by-step tutorial in pics! Ooh la la. We are loving Forage Fashion's crisp outfit perfection featuring a white button down shirt, blue shorts, and bright yellow pumps! Heather's hi-lo blouse from Ann Taylor LOFT is so elegant and she turns up the volume on this look with her playfully bright shorts and heels. 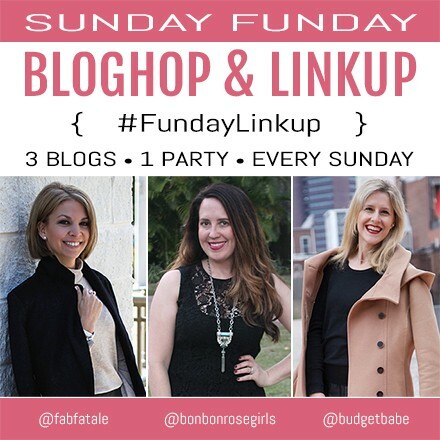 Thank you so much for sharing your #FundayLinkup with our readers, Heather! Lauren McBride is loving spring's slide sandal trend. Modest Budgetbelle rounds up fashion blogger looks that are perfect for wedding attire. Momomod styles her ASOS LBD for summer. A Little Bit of Cheer shows us cute outfits to pack for a weekend getaway. Jan Loves is rocking a denim-look dress and on-trend mules. Just in time for Nordstrom's Half Yearly Sale, one lucky reader will win a $50 Nordstrom gift card! Follow the directions in the RaffleCopter below for a chance to win. Open to US residents of at least 18 years of age. Loving all of these links! Hope you are having a great weekend!